Take a 150kg block of ice, a Chainsaw, some chisels, a die grinder, some serious sweat and you will have a spectacle to remember. Ice Art held a stand at Cavendish Bridal Fair where Live Ice Carving demonstrations were serious crowd pleasers. 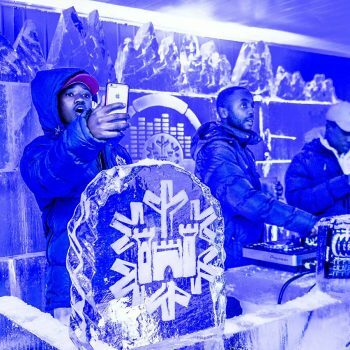 “The live ice carving with power tools and ice sculpture chisels is something that very few people have the chance to witness and it is therefore always of great entertainment to young and old alike,” explains James Cussen, Director of Ice Art. These sculptures were designs that fit well with weddings. 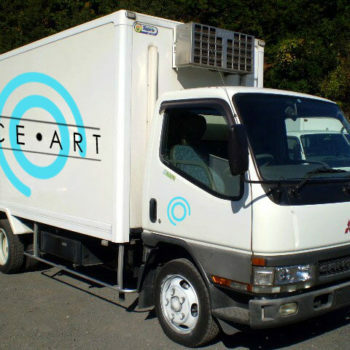 When carving ice in their freezer at the Ice Art factory the sculptors can spend many hours on a single creation – they have the luxury of a sub-zero climate and the ice does not melt. 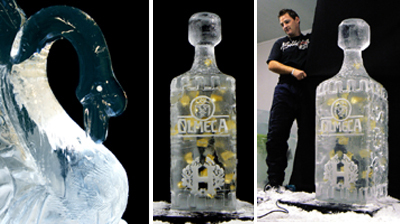 When performing a live carving the sculptor only has 90 minutes to complete the ice sculpture as after this time, in normal ambient temperature the ice becomes too soft to work on. The finished piece can then be on display for many hours thereafter. 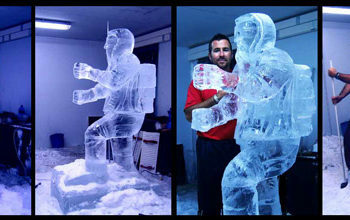 “We have had clients who need a live ice sculpture completed from start to finish in under 20 minutes! Mainly due to the short duration of the pre-drinks for example,” says James. “Of course, in that scenario we have to work on a specific subject that can be successfully completed in that time, and at high speed too.” In general the subject that needs to be carved live will be something that can be completed within 90 minutes. When using chainsaws and power tools, safety is of high priority and there is always an assistant to the carver on site to trade tools, clean up the ice and keep the area safe. It is also very effective to have an ice carving education narrator on site with a mike to explain to the guests the history of the industry, the methods behind the madness and general facts about the nature of ice. 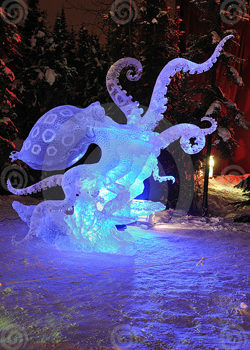 There is certainly nothing else quite like a live ice carving for on site entertainment.